The RISC OS Products Directory - What is RISC OS? RISC OS is an exceptionally stable operating system, tried, tested and trusted by hundreds of thousands of users worldwide! RISC OS is written 46% in C, 44% in hand-crafted ARM assembler code and 10% in BBC BASIC. So hand-crafted in fact that RISC OS 4 is much faster than earlier versions of the operating system on the same hardware! RISC OS is housed in a 4Mb ROM (or Flash-ROM), which is unusual for an operating system of this sophistication. This small code size can in part be attributed to the fact that RISC OS knows exactly what hardware it will be running on. A RISC OS computer can boot up from cold in under half a minute! It can also shut down instantly; it has no need to wait whilst writing data back to the harddisc! RISC OS is a module-based operating system. Modules can be soft-loaded to 'replace' those in ROM or new ones added to extend the operating system's capabilities. Applications communicate with these modules through the calling of thousands of Software Interrupts (SWIs); similar to Windows API calls. RISC OS has a co-operative multi-tasking Graphical User Interface (GUI) known as the Desktop. RISC OS is very revolutionary. The Desktop is largely unchanged for 14 years because it was designed correctly in the first place! Like all GUIs, the RISC OS Desktop has a learning curve, but once learnt, it is by far the most user friendly and productive GUI in the world today. As so much can be done directly from the RISC OS Desktop, you will hardly ever need to leave it for the command line. You can easily select the current directory in the Desktop prior to going to the command line. The pathname of a file can be easily written at the current cursor position, simply by holding down shift and dropping the file over the window. The printer manager supplied with RISC OS is superior to that found on other operating systems in that it is bitmap- rather than font-based. This makes it slightly slower but the printed output is incredibly accurate. The window stacking order can be maintained even when giving a window input focus; windows are not automatically brought to the top when given input focus. You can type into a window whilst another window is obscuring part of it. RISC OS can be used by primary school children through to professional printers, designers and musicians. The acclaimed music program 'Sibelius' originated on the RISC OS platform! 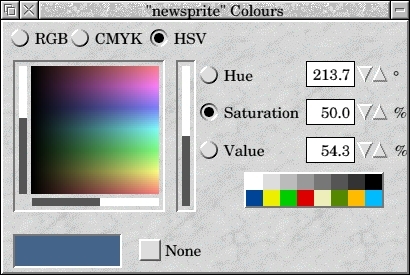 Edit, Paint and Draw are supplied as standard on every RISC OS computer. Edit is a multi-file multi-window text editor - you can have different views on the same file - you can have as many 'untitled' windows as you want. Paint is a bitmap graphics editor mainly used for designing icons and capturing screen shots; it can load JPEGs. Draw is an excellent vector-graphics application. The Draw application is so useful that many applications have taken to outputting in the Draw file format in addition to their own native format. RISC OS computers have superb graphics with 24-bit colour support. Almost every screen mode on a RISC OS computer possesses both a text cursor and a graphics cursor. Text can be plotted at the graphics cursor and the text and graphics cursors can be combined. RISC OS computers have 16-bit sound support. The humble mouse pointer is capable of providing a lot of information. It may be changed to a 'double arrow head' to indicate you're in the middle of a double click. It can be turned into an animated hourglass to indicate the computer is busy. Percentages can be programmatically shown under the hourglass when long operations are taking place. Software is available to read and create many so-called 'industry standard' file formats (i.e. Microsoft Word (.DOC), GIF, JPEG, PDF, etc). RISC OS uses the same end-of-line sequence (i.e. 'LF') as Unix (and the Internet) as opposed to Windows and MacOS which use 'CR LF' and 'CR' respectively. RISC OS supports real long filenames as opposed to a pseudo long filename mapping onto a file with a short name. Unlike under Microsoft Windows, the space (ASCII 32) and full stop are not valid characters in filenames. The full pathname is always shown in the title bar of a directory display. Column widths within directory displays automatically change to accommodate files with long names. The RISC OS Desktop possesses a watchdog that allows you to easily kill runaway programs that fail to return control to the Wimp Manager. All the Desktop file icons, icon bar icons and window furniture can be 'replaced', giving your Desktop a totally different look! RISC OS does not have hidden files; with operating system files, application files and a user's data files so neatly departmentalised, there is very little, if any, need for hidden files. You can have an unlimited number of files per directory. An '*' is shown in the title bar of most windows to indicate that the data within has been altered but not yet saved. Apps folder supplied as standard from where all built-in applications can be launched and to which your favourite applications can be added. Anti-aliased fonts, including font blending, are used throughout the Desktop. RISC OS has had a three-button mouse from the very beginning when each button was assigned a specific purpose. The use of each button is totally consistent throughout the entire Desktop. You can, for example, select a menu item without closing the menu or scroll both scroll bars of the same window at the same time. The third button can also be used to do the reverse of the first button; if the first scrolls up a window when clicked over a particular icon, the third button will scroll it down. Much more can be done directly from the mouse; there is less need to keep reaching for the Shift key! The third mouse button can be compared to holding down Shift whilst clicking the left mouse button under Windows. RISC OS applications with the same functionality as on other platforms take up less hard disc space and require less memory to run. As an example, EasiWriter Professional+, RISC OS's answer to Microsoft Word (whose files it can read), uses only 1101Kb of hard disc space and 860Kb of RAM (all-be-it without a document loaded). The command line and the Desktop are part of the same operating system. The command line can be reached from the Desktop with one single key press. Function keys are used quite extensively in the Desktop; F12 always takes you instantly to the command line. You can return to the Desktop just as easily. Drag and drop operations throughout the Desktop. There is no such thing as an 'Open Dialog'! There are two types of drop with regard to applications - dropping on the icon bar opens a new window whilst dropping on an open window appends the data. There are many commands that can be executed from the command line. Almost all the configuration can be done from either the Desktop or from the command line. The command line possesses a full screen copy and paste facility. The link between a particular filetype and an application which can load it is allocated dynamically. Once an application has been 'seen', it will be used to load files of a particular type (or sometimes several types). Such an association can be redefined simply by 'seeing' a different application capable of loading the particular filetype. You will never be stuck with an unwanted application always loading a particular filetype; if RISC OS hasn't seen it, it won't use it. 3-D effects throughout the Desktop. The window furniture is well designed - no maximise and close buttons right next to each other! The size of a window scroll bar correctly reflects the proportion of the document visible. Although a window can be held within the confines of another window, this is not normal RISC OS practice. The scroll bars are sticky, in that if you're scrolling up and down with the mouse, you will not 'fall off'. No menu bar to waste one line of the screen per window. All menus are pop up, movable and scrollable. All menus have title bars. A menu opened against the right-hand side of the screen can be dragged to the left in order to open submenus. A menu will always open as high as it needs; a menu too high for the screen will automatically be given a scrollbar. The free and used space on discs are dynamically updated as files are created, copied, moved or deleted. It is extremely easy to copy a file and name the copy sensibly. Given a 2Mb unformatted floppy disc, RISC OS will format it to hold 1.6Mb of data; incidently, RISC OS can read MS-DOS-formatted 720K and 1.44Mb floppy discs as standard. With a 3rd party add-on, modern Mac discs can be read as well. RISC OS has the ability to handle more than one floppy disc at a time, with each floppy disc having a unique name. As each floppy disc is mounted, RISC OS remembers its contents. You can then remove the first floppy disc from the drive and insert and mount another. If you then click on an object in the directory display for the first floppy disc, RISC OS will ask for it to be re-inserted. This makes it very easy to copy files from one floppy to another on a single floppy-disc machine with no hard disc! You can quite happily leave a floppy disc in the drive whilst booting up; the computer will not try to boot off of it unless it has had its boot flag set. Directory windows are only as big as required to display the objects contained within. Such directory displays are always shown to the user's detail and sort requirements; there is never any need to refresh a directory display - it is always shown up-to-date. Objects are always shown in their alphabetical order regardless of whether they are directories or files. Modified files always appear in their correct place in a directory display; you will never find a modified file going to the end of the listing when viewing objects in alphabetical order. Only one copy of each directory display will ever appear on the Desktop. A directory display will automatically rearrange the objects it contains when resized. Applications are easily installed - sometimes you just copy from the original master disc to the hard disc. Many applications can be run from floppy disc. Applications can be just as easily removed with no left-behind 'hidden' files. Most applications can be run from any storage location you choose; the location is not normally fixed when the software is 'installed'. You will hardly ever be asked to reboot your computer after installing a new piece of software. Each application resides in an 'application directory'. Just double-click on such an application directory and the application will be run. All the files making up the application are 'hidden' from view of the average user inside the application directory. An application directory can however be opened just like a normal directory by double-clicking with shift held down. Windows can be made to remain on the screen rather than going off the edge. RISC OS can use the Display Power Management Signalling (DPMS) mechanism where the monitor supports it to reduce the monitor's power consumption. Toolbars can be attached to windows. Every window has a back button; this can be used to send the window to the bottom of the window stack. Windows do not become unmovable when maximised. Objects can be dragged and dropped onto the icon bar. As icons are placed on the iconbar, making it too wide for the screen, it scrolls from side to side; move the mouse pointer to the left and the iconbar scrolls to the right! 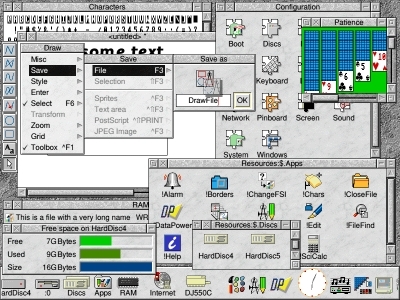 The RISC OS Desktop possesses a pinboard and backdrop. There are no operating-system specific features on the pinboard, so there is no need to fight your way to the bottom of the window stack in order to locate and execute them. Data can be saved by dragging the save icon out of the save window and dropping over a directory display or on to a drive icon on the icon bar. Some applications will even load data saved out of another application - i.e. no intermediate saving to disc takes place. It is not a requirement that a RISC OS computer has to have a hard disc. Built-in BBC BASIC programming language which uses procedures and functions, making GOTOs, GOSUBs and line numbers redundant. BBC BASIC can be used to write simple programs through to very complex Desktop applications. You may like to know that Acorn's first release of the Desktop in 1987 was written in BBC BASIC! BBC BASIC includes its own ARM assembler! A RISC OS computer can start up in either command line mode, BBC BASIC mode or Desktop mode. There is a command line command that tells you what expansion cards are fitted and in what slots. A command-line command exists to display system variables. Any file, and we do mean absolutely any file, can be loaded into the text editor simply by holding down the shift key whilst double-clicking on the file's icon. A very simple TCP/IP-based networking system (Access+) is built-in as standard. TCP/IP is the protocol used by the Internet! Additional software is available to enable connection to foreign networks (i.e. Windows). Most computer viruses in the world today are aimed at the Windows platform. Using RISC OS will protect you from most, if not all, of them. As RISC OS is in ROM, the core operating system modules can not be accidently or maliciously corrupted and should the softloadable ones become corrupted, you just reboot using the ROM-based modules. The CMOS RAM and hard disc can be password protected against malicious or accidental changes. A RISC OS computer gives the user the feeling that they're in control - basically because they are! There is very little evidence of you and the operating system trying to use the computer at the same time and the OS winning! RISC OS does not litter your hard disc with temporary files. You get the impression that RISC OS applications are co-operating with each other rather than trying to do everything themselves; the operating system itself positively encourages this way of working. The entire system has a feeling of tidiness. RISC OS has an excellent task display that tells you exactly where your computer's memory is being used. From every directory display you can go up or down the directory hierarchy and dynamically decide whether to replace or leave the higher/lower level directory display. From an application window, you can show the directory display from where the application's data file was loaded. The 'up' icon is always visible even when the directory display is as small as can be. In the event of a software malfunction, the computer can be booted up without 'seeing' or running files off of its hard disc; there is no concept of a safe mode! All applications have a consistent look and feel due to the excellent Toolbox. RAM disc support - same functionality as a physical disc, only in RAM! Pipe filing system - One application writes a file, another application reads it and the file is gone! RISC OS has a global clipboard. There are many different filing systems available on RISC OS geared to different storage devices. So failing to turn on a particular storage device will not suddenly alter your drive letters as RISC OS does not use them. The Desktop can be configured without having to reset the machine. 128 bit SSL support is available as third-party Internet software. RISC OS-based computers are manufactured by more than one computer manufacturer. 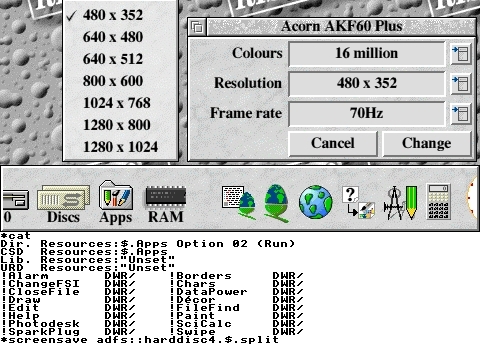 It is a testiment to the Acorn RiscPC design that it is still being manufactured two years after the demise of Acorn Computers Ltd (who incidently did not go bankrupt but were brought out due to the large amount of ARM Ltd shares they held). There is a wide range of educational, home and business software available. There are many emulators available for the platform, thereby increasing the number of software titles that can be run. RISC OS computers are built to last for many many years both in terms of hardware reliability and software evolution. There are still many 10 year old RISC OS computers in regular daily use (and we don't mean relegated to doing menial tasks). RISC OS is owned by Pace Micro Technology plc who are currently investing a lot of money in it so that it can be used in their own consumer goods. RISC OS is an evolution of Acorn's excellent Machine Operating System as found in the Acorn/BBC computers of the early 1980's. Acorn Computers Ltd won the BBC contract to build the computer that would be supplied to many British schools because it met all the requirements laid down. RISC OS does not, however, have any 8-bit legacy problems (Acorn skipped making a 16-bit computer) as when the Archimedes was launched, the 8-bit BBC computer (which used a 6502 microprocessor) was totally emulated in software. RISC OS computers use 'industry standard' monitors, keyboards and peripherals. Most use 'industry standard' three-button mice as well. Several C compilers are available for the platform, although none is supplied as standard. As for modern hardware, MicroDigital's Mico computer has USB and some RiscStation's machine have PCI. The RISC OS Desktop is considered so good that a 'look and feel' copy of it has already been developed for the Linux platform. A RISC OS emulator exists for the Windows platform. The latest version of RISC OS is 4.2x; supplied as part of the RISC OS Select scheme. The Internet is making the ability to read the same file format more important that running the same application or using the same operating system. The most important thing about RISC OS is that it is a joy to use; you do not feel that the OS is getting in the way of what you are trying to do! Many people would say that RISC OS is a minority platform. We consider this an advantage for two reasons. Firstly, RISC OS, because of its minority status, tries to be as compatible as possible with many other computer operating systems but without compromising its own superiority. Secondly, the 'RISC OS community' is an extremely friendly one and you'd be made most welcome. The fastest processor on which RISC OS can currently be run is the 233MHz Intel StrongARM. 733MHz Intel XScale (StrongARM 2) processors are almost in existence (with 1GHz on the way) but no RISC OS computer is currently using them because the 26-bit addressing mode of the operating system needs to be altered to 32-bit as Intel are no longer testing the 26-bit addressing mode within newer StrongARM chips. Pace and RISCOS Ltd have basically now got a 32-bit addressing mode version of RISC OS. XScale (as Intel are to rename the StrongARM) has a roadmap that takes it well beyond 1GHz, so don't think for one minute that a 32-bit addressing mode version of RISC OS will be tied to a slow processor! In fact, Castle are committed to developing the Acorn range of machines and one of their objectives is to incorporate faster processors in the future! As RISC OS has always known what hardware it was going to be run on, it had built-in support for such Acorn proprietary chips as VIDC and IOMD. In the newer non-Acorn machines, these chips may not be fitted so the operating system has to be fooled into thinking that they are. The Imago board uses special circuitry for this purpose. RISC OS itself (which can address up to 64Mb of memory) does not have support for virtual memory but it does support dynamic memory areas for third party applications to make use of. An application from Clares called Virtualise does however provide a general purpose virtual memory system for RiscPC & A7000 dynamic areas. Drivers for certain printers are not available for the RISC OS platform; this is primarily because the printer's manufacturer has failed to write a driver for use under RISC OS and it's left to RISC OS 'printer driver' specialists to write the necessary driver. However, many printers are supported. The RISC OS command line is single-tasking. In the Desktop, you can, however, open many command line task windows simultaneously. The RISC OS Desktop uses co-operative multi-tasking - this means that it is up to an application's programmer to give control back to the Wimp Manager and other Desktop tasks rather than the operating system time-slicing them. RISC OS is not a multi-threaded operating system. Each Desktop application only has one thread running through it at a time. RISC OS does not use file extensions; it uses file types instead. Under most other operating systems, you could have two files, foo.txt and foo.pl, in the same directory. With RISC OS, you could not have two files named foo in the same directory even if they're of different types. There is nothing to stop you naming them foo/txt and foo/pl where the /... part has no meaning under RISC OS except as a way of handling MS-DOS/Windows files. It is impossible to give a file two filetypes unlike under Windows where 'foo.txt.pl' would be possible. Although RISC OS does not support Unicode (although Pace may be working on this), some foreign language character sets are indeed present. It use to be that when upgrading the operating system, you would need to remove the two old RISC OS ROMs and replace them with new ones. Newer versions of RISC OS will now be supplied as softloadable modules. Where are RISC OS Computers Used? RISC OS computers can be found in the most unexpected of places; did you know that the "Who wants to be a millionaire?" television show on ITV is run by a RISC OS computer. The Hong Kong Stock Exchange used to be run (and may still be) by Acorn 32-bit computers. RISC OS computers are used a lot in the television industry and in industrial control where the computers are used 24 hours a day, 7 days a week. ... and see for yourself what RISC OS can do for you. You will never regret your choice of RISC OS!